The important factors to consider when selecting a fire leviwand are size, weight, consistent balance, burn time, minimized exposed metal, and leash durability. These wands come with a default short-string setup (with swivel and Shadow Cord fingerloop). If you would like a long-string setup, select Extra Shadow Cord from the options below. All Sparkle tape wands have a layer of clear silicone over the sparkles to protect them and enable the wand to be used for contact. 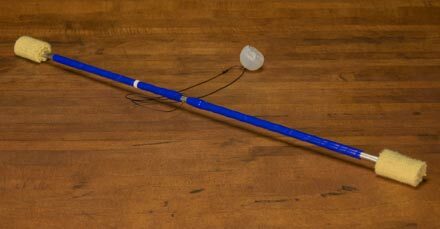 This 28" wand is suited for both short and long string wand spinners. We offer two options: a heavier and a lighter version. The Light Wand (4.2 oz) is made of 7075-T6 aluminum, which is twice as hard to bend as most other types of aluminum available. Its light weight makes it extremely responsive to sharp changes in direction. It is generally preferred by long string wand spinners. Most severe equipment burns come from searing-hot exposed metal, not from the wicks. To minimize exposed metal, these wand wicks are attached with recessed rivets (less exposed metal than screws and no need for retightening). And, the wand’s body is covered with a colored silicone wrap that diffuses heat and allows you to safely touch the wand within an inch of the burning wicks without being burned. This silicone wrap also provides a grippy surface that allows you to do contact staff movements like fishtails with your wand. Shadow Cord is a soft and durable Leviwand leash, made from a material used extensively by NASA. This fine cord has a tensile strength of 200lbs, with the flame resistance of Kevlar and three times its abrasion resistance. This ensures that the wand’s flames won’t easily burn through the leash, and that it won’t get worn down sliding through the wand’s center hole. 3) A PomGrip. This is a small silicone knob that fits comfortably in the hand. Some creative wand spinners have begun playing around with Leviwand tosses (much like one would do poi tosses with ball handles), and PomGrips allow for that.